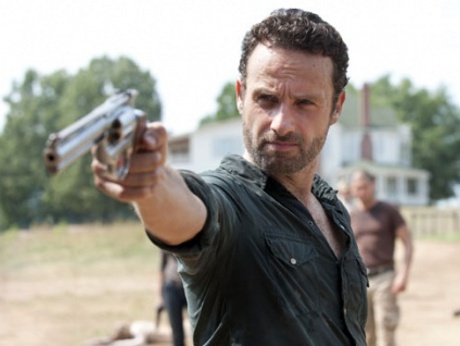 “The Walking Dead” Season 3: Will Rick Grimes Be Killed off Before Executive Producer Glen Mazzara Leaves Show? If you’re a Walking Dead fan then I’m sure you’ve heard the news about executive producer Glen Mazzara‘s departure from the show. He will not be returning for season 4 and that means, of course, they will be on the lookout for someone worthy enough to take his place. But before his departure, we have to wonder about one thing: what changes will he make before he walks out the door? I think it’s safe to say that The Walking Dead is a character-driven show. While it does deliver compelling plot lines, the heart of the story definitely focuses on the characters and their interactions in this zombie-infested world. Fans of the show root, despise, and care for characters with great passion . . . . So is Glen going to make fans sweat it out and hold their breath as they wait to see if their fave character makes it out uneaten or undead? The killing off of Rick would definitely lead to some drama — perhaps even chaos. But the thing about a zombie apocalypse is nobody is safe. Unlike other genres, apocalyptic shows make the killing off of a main character somewhat acceptable. And if Rick was given the axe, that could leave room for another leading guy or gal to emerge. If there was ever a “correct” time to get rid of Rick, it’s now. After all, The Governor is proving to be a tough opponent, and who knows what will be the result of their first meeting. Will it mark the end of Rick? I haven’t read the comics but, apparently, the killing of Rick would be a departure from those storylines. Who knows what could happen! Keep an eye out for our other Walking Dead coverage. We bring you regular previews, spoilers, and recaps, so continue to stick with us for all your television needs!